Most, if not all of the 14” cast iron band saws are clones of the Delta. Prices are all over, depending on condition, location, accessories, etc… Surface rust is a great negotiation point to reduce cost, and is super simple to get rid of. Induction motors are hard to kill, and even if they don’t run, they usually only need something stupid simple to fix. Bearings, belts, tires and guides are all considered maintenance items and should be replaced regardless, but again, can be used as a negotiation point to lower the price. The single biggest issue is missing/broken parts. If it’s complete, then it can be cleaned up and reconditioned to like new without much expense. If it’s missing parts or has broken/damaged pieces, then you may have a very difficult time finding them, and many can be rather expensive to replace. The key to getting a good deal is knowing what you want, keeping an eye out for it, and being able to pounce when it does show up. Ridgid’s bandsaw has long been the week iink in their power to offerings. It can be made serviceable, but takes some effort to strengthen the base and balance the tires. Hello B4B, keep an eye out for a 14” American made Delta bandsaw, any age as long as it is Made in USA. They have always been the standard of the industry, well built and stand up to vigorous work out. There are parts readily available, though most times they don’t require them. I have been able to find them from 250.00 to 350.00 range. Stay as far away from Rikon and Rigid and Jet as you can, IMHO. Have fun, make some dust. For 14” saws look for Powermatic 141/143 (assuming you don’t need over 6” of resaw height) those and the General 15” 490 are the best small cast saws ever made along with Walker Turner. I shy away from suggesting Walker Turner for someone just sticking their toe small used bandsaws since parts can be an issue. American made Delta’s are also good but they quality varied over the years and in the end they are pretty light weight. They were designed 80+ years ago with the idea of running a 1/4” general purpose blade. Many users really stretch their capacity these days. In reality many of the 14” steel spined saws are much more capable than even the best Delta. Bought a Central Machinery (aka Harbor Freight) 14” for $40 on CList. The listing said it wouldn’t track straight. It had no tires on it. Cast iron and works as well as my buddy’s Grizzly. Probably you shouldn’t just assume that a 14 inch Ridgid bandsaw is poor quality. I’ve had one for years and have no problem with it. Recently it was cutting rather slowly, so I put a new 3/8 Timberwolf blade on it, and man we are bandsawing like a champion. I put new urethane tires on it 3 or 4 years ago. Ceramic guides were added maybe 5 years ago. I paid $350 for it new. The next bandsaw will cost 3 or 4 times that, so what I got for $350 was a decent bandsaw. saw is in good working condition. Taiwan 14” saw, it was a lemon anyway. making the wheels co-planar and so forth. I was looking on CL last week, and I was surprised at how high the asking price was on used bandsaws. In terms of asking prices, I’d say they’re overpriced compared to table saws. Unless you’re really tight for space, I wouldn’t consider anything smaller than 14”, and as a first saw, I wouldn’t go with anything larger. As already said, most 14” saws in the used market will be Delta clones. I can’t argue that while saws by Powermatic, General, and Delta would be better quality, you are also paying for name brand recognition, and personally I think this particularly applies to Jet tools- way overpriced for the quality. I also believe that the Ridgid is a “diamond in the rough”- it’s gotten some bad rep, but with a little tuning up the one I got off CL a few years ago works great (there are lots of good suggestions online). I don’t think that the Ridgid is significantly worse than other clones, and if you find one, you might be able to use the bad rep to bargain down the price. While I haven’t seen many on CL, a 14” steel frame (not cast iron) would be worth considering- Laguna, Rikon, and Craftsman (seems to be a Rikon re-badge). In reviews I’ve seen steel frames tend to rate higher than CI. The drawbacks are you can’t insert a riser block for increased resaw capacity, and they don’t use the “standard” 93-1/2” blade length of the Delta CI clones. Finally, since nobody has yet mentioned it, you can’t go too far wrong with Grizzly. Good luck. Brand centric advice sounds good. Sounds like I can’t go wrong with any of the major brands. I have considered a new grizzly, I’m within driving distance of their Bellingham showroom, so I’d avoid freight. I’d probably go for the G0555LX for $575 plus 10% tax. It has the cast iron wheels vs cast aluminum on their go580 that’s about 125 less. That said, I was hoping to score something for around $300 or less on the second hand market, but the asking price on many used machines is all over the place, most seem to be around the 450 mark. I’m not sure if my price point is a reasonable/fair expectation for a well running machine . . I don’t mind tinkering or replacing parts as long as the seller is willing to sell at an appropriate price for the condition and parts are available. Go get the G0555LX, good blades, and go to work. I’ve got an OLD Walker Turner. They are great saws as long as the castings are in good shape. Wear items like bearings, tires, sheaves, belts are motors are pretty easy to replace. Brand centric advice sounds good. Sounds like I can t go wrong with any of the major brands. I have considered a new grizzly, I m within driving distance of their Bellingham showroom, so I d avoid freight. I d probably go for the G0555LX for $575 plus 10% tax. It has the cast iron wheels vs cast aluminum on their go580 that s about 125 less. That said, I was hoping to score something for around $300 or less on the second hand market, but the asking price on many used machines is all over the place, most seem to be around the 450 mark. I m not sure if my price point is a reasonable/fair expectation for a well running machine . . I don t mind tinkering or replacing parts as long as the seller is willing to sell at an appropriate price for the condition and parts are available. The problem is prices are often all over the place on the low end of the market. Lots of people that don’t have any concept of the actual value of used saws are selling the smaller saws. They may have bought them and used them once so they thing they should sell for almost new price and although they bought a cheap off-brand saw when they look up a comparison price they can’t find that saw and use a Powermatic or Jet to set the “new” price. You can find deals in the $300 range but it may take some time. 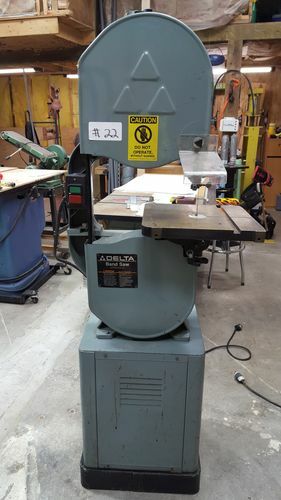 I see old Deltas from $200 up to over $1,000 and PM 141s from $300 to near $1,500 (but those are well regarded saws that were right at $2,000 when they were last sold by Powermatic near 30 years ago). In the end there is nothing wrong with the Grizzly choice, it is a decent copy of the Delta saws and you have a good idea what you are getting. There is just less money to be saved buying used on the budget end compared to buying much bigger more expensive saws, compare the deals one can get on a 14” saw when you can buy a 36” saw that sells for over $20,000 today for between $1k and 2K with a little looking. I got lucky on CL a few years back and picked up a 14” Grizzly for 150. New blade, a little tuning, and it has been a great saw for a hobbyist. The craftsman Rikon lookalike is cheapened version of the Rikon. I have the 14” Rikon deluxe no issues and no need for a riser block. Rikon 14” has a 13” resaw capacity. The Ridgid bandsaw may have a lot of bad reviews but don’t count them out. If possible, check it out in person. I have a Ridgid (the older grey model) and it works like a champ. It passes the nickel test easily (little vibration). I’m with the general consensus on the Delta. I picked up a 14” Delta 28-203 for $150 at an auction a couple months ago. Was missing half of the top guide ($50 on Amazon) and probably needs new tires, but other than that is a champ. One nice thing about the Delta is every now and again you stumble on a riser block for sale for $100 and suddenly you have a really nice saw with great resaw capabilities. I have read on a couple other forums, with a little modification, the Riser Block from Grizzly’s 14” saw will work. If you are not daunted by a “project” when it comes to used equipment, keep your eyes on this website. Search “Browse Auctions within Area” (right hand side) click on the State of Washington, then click on Industrial Equipment (left hand side). Its a fun site to check on every week. Don’t know how long this link will last, I picked this slightly bigger bandsaw 2 weeks ago for $400. One nice thing about the Delta is every now and again you stumble on a riser block for sale for $100 and suddenly you have a really nice saw with great resaw capabilities. They sell them on eBay but the price is about $250 shipped. Closer to 300$ with shipping for the one I want. About to bite the bullet and get the Griz riser once I figure out what I’m going to do about the guide bar. Probably get a price on machining one.